I can't even...just. wow. I don't know why you write things anymore. Now we have fans rapping Leyland for not playing him more. Very mature take on the situation. Same conversation - different year - with whatever the new 4A arrival is. I would say Q-Berry is the 2012 4A addition - like both Boesch and Raburn were in years before - as well as Brnt Cleveland and [name some others I can't think of off the tiop of my head]- regardless of his age. It took a couple seasons for Raburn to stay up all year. The Tiger's do this more than other teams I have followed. You know that - Toledo dipping. Like I have said here before - just like a goalie - you ride him while he's hot - but I don't think asnybody thinks he's the second coming of Roberto Clemente. The Book he doth protest too much, methinks. While Berry is not the second coming of Ty Cobb as some finds currently perceive, you have settled to comfortably into your Earl Weaver role of sitting and waiting for the 3 run homer. Having Jackson and Berry on base in front of Cabrera and Fielder is CERTAINLY a recipe for mored runs. (Your complaint that he did not score more runs ins a 5 hit game is disingenuous-- You basically blame him for not stealing his way around the bases). Fans are overreacting to something very real. His is fast and can field his position. Many of the starters lack both talents. He brings balance to a lineup of DH's. Let him hit himself out of the majors like chris shelton. 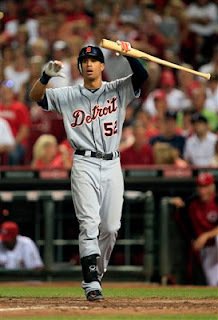 Dirks, Jackson, and Boesch is the optimal outfield. has always provided value in every league he has played. Should QBerry be ahead of AJackson or Dirks absolutely not. Should Berry play against tough lefties absolutely not. Having two speedsters in the field, then it allow a real slowpoke in the other field position that can bang 25 homers. For BB and DY to have any value they have to hit 12 to 13 points above their career average, good luck with that. I would keep playing DY and BB to get their trade value up and trade them to a small ballpark team. Gutherie can pitch on my team anytime but not at $8 million a season. Someone is going to get a deal when they pick him up this off season. Too bad he is 33 already.